A Spoonful of Spit Up: 10 reasons why minivans are the BEST. If you're my friend on Facebook, you already know this. But I'm going to tell the rest of you now! We have welcomed a new member of our family. Do you guys have minivans? If you don't, you should. Because they're the best. I know that some people are SUPER against minivans. I'm pretty sure that, at some point in my life (when I was young and silly), I said that I never wanted a minivan. But I have seen the light! Vans are awesome. And here's why. 1. SLIDING DOORS. Which means Gibson can't whack other cars with his door when he opens it. 2. And, even better than sliding doors...POWER SLIDING DOORS. I can push a button and the doors open ALL BY THEMSELVES. Oh my gosh. I love it so much. 3. POWER LIFTGATE. I can open the back of the van with a button! When I have an almost thirty pound child in one arm and a diaper bag/shopping bags/huge vat of coffee in the other, opening things is hard. Buttons are easy peasy. 4. LEG ROOM. In our Mazda3, I sit with my knees up against the dash (super safe!) because with Gibson rear facing behind me, my seat has to be all the way up. But in the van I can full extend my legs and do the can-can! Just what I've always wanted! 5. CUP HOLDERS. Holy COW there are a lot of cup holders! Like, approximately one million. We could go to McDonald's to get drinks seven times and never have to throw a cup away! ...not that we would do that, of course. 6. STORAGE. If you thought there were a lot of cup holders in our van, you should see the storage! There are hidden drawers, purse cubbies, and toy boxes galore! Toy boxes are what Danny and his brother called the storage things in the back of their van growing up. Because apparently theirs were full of toys! 7. REAR CLIMATE CONTROL. There's a vent directly above Gibson's car seat...which means that when it's really freaking hot here (like now, ugh) he doesn't have to be a sweaty mess! Because pregnant Erin needs ALL of the front air. Every single bit of it. 8. STOW N GO. In our van, all of the seats fold flat INTO THE FLOOR. And when the seats are up, we can keep things UNDER THE FLOOR. If Indiana Jones had a van, I'm pretty sure it would have Stow N Go*. *I have never seen an Indiana Jones movie. He might hate Stow N Go for all I know. 9. CAPTAIN'S CHAIRS. I love that the middle isn't a bench seat. I can walk to the back of the van if I need to without putting a seat down! Also, when my kids are older, they each have their own seat, which will hopefully cut down on the "MOM! He's touching my side of the car!" I mean, I know it won't eliminate the whining. Because children are whiny. But hopefully it helps! 10. GIBSON LOVES IT. This is the most important part! From the moment Gibson saw the van, he has loved it. He says "Caw! Caw!" (which means car, of course), and gets super excited when we ask if he wants to go in the car. "CAW CAW CAW CAW!" ...he's like a crow. Except he doesn't eat worms. I hope. For those of you who have minivans, tell me why you love them! Those of you who don't should go out and get one NOW. There's so much room! And you'll feel super cool driving it, if you're anything like me. You guys. I have bad news. 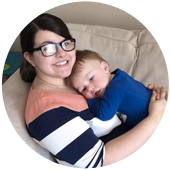 I am no longer the best stay at home mom blog on Top Mommy Blogs. But I bet we can remedy that! Just click the pink banner below to vote! If you do, I'll send you a minivan! ...or a picture of one, at least. What, do you think I'm made of minivans? I have a mom mini van and I swore I would never drive one. BTW, I LOVE IT. Her name is Swagger Wagon, because she swags us where ever we want to go in comfort and safety. My fave feature is the multiple plug in outlets that let's my son put in his DS or movie while we are road trippin'. *fist bump* to another Momma who loves her big, parking space hogging van!